After a full day of sightseeing in Victoria it was time to take an early evening floatplane trip back to Vancouver. We took off just as the sun was beginning its descent into the horizon and the views were beautiful. When we arrived back in Vancouver it was time to head off and find some food. After having skipped lunch in favor of gelato and having walked all over Butchart Gardens, we were pretty hungry. Luckily, the floatplane terminal is right in downtown Vancouver and we were so close to the Convention Center and Canada Place. There were a ton of food options in the area. Since we hadn’t planned in advance, we weren’t looking for anything too fancy, just something we could both enjoy and that would fill us up. As we headed towards Canada Place, we saw an Italian restaurant with indoor and outdoor seating on the backside of the Convention Center with views of Canada Place and we agreed this looked to be as good of a choice as any for dinner. Bellagio Cafe is an Italian restaurant with two downtown Vancouver locations. Opening its doors on Canada Day 2011, the Convention Center location features a wood stone pizza oven, an extensive wine selection and indoor and outdoor seating that affords views of the mountains and the harbor as well as the beautiful architecture of Canada Place. This downtown location near Canada Place was so convenient for us as it was close to the floatplane terminal and all within walking distance of our hotel, and the atmosphere of the restaurant was relaxed and peaceful and outdoor seating with heat lamps available, even though it was the evening, was nice and quiet and a great way to unwind at the end of a very busy day. My husband decided to unwind with a pint of Stanley Park Amber Ale. Brewed locally by Stanley Park Brewing and in honor of the city’s great Stanley Park, this ale is made in the Belgian ale style using a blend of specialty Belgian malts, East Kent Golding hops and a distinctive ale yeast which all creates this golden amber ale with a soft caramel aroma. 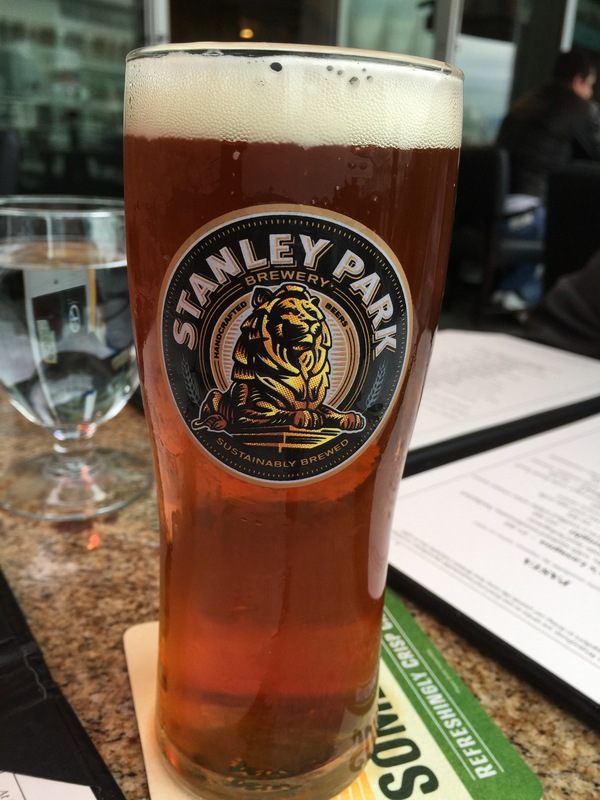 My husband thought that the Stanley Park Amber Ale was easy to drink and went down smooth. He appreciated the flavor of it, even though this is generally a lighter beer than he usually enjoys. For a light amber ale, this one was a winner for him and unexpectedly he enjoyed it more than he thought he would. As we had skipped lunch this day, we decided we’d order two different appetizers to fill up on dinner. Our first appetizer was the crab cake. 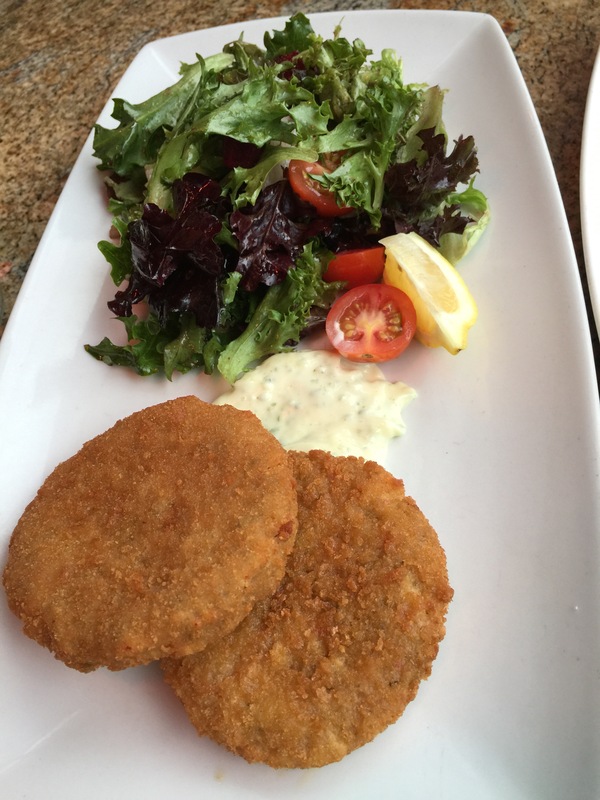 Breaded crab cakes were served with mixed greens with beets, cherry tomatoes and a basil aioli. Unfortunately, I don’t think my husband nor I were particularly overjoyed at the crab cakes. First off, the crab cakes appeared to be more like flat patties than crab cakes. They were also very heavily breaded and contained a lot of fillers and it didn’t really taste like it had very much actual crab meat at all, which was disappointing. The crab cakes were nice and crunchy, but the flavor just wasn’t there. The best part of the appetizer, I thought, was the mixed green salad that came with it, so that tells you what you need to do know about the crab cakes. I could have done without these. The second appetizer we chose was the calamari fritti. Generally speaking, I’m the calamari fan and my husband is not. He will tolerate it every now and then, but usually he’d prefer that we not order the calamari. However, this time, he said we should go ahead and order the calamari as well. Served with a citrus infused chipotle aioli, the calamari fritti was billed as being crispy on the outside and tender on the inside. When the dish was presented at the table, it looked mouthwatering. 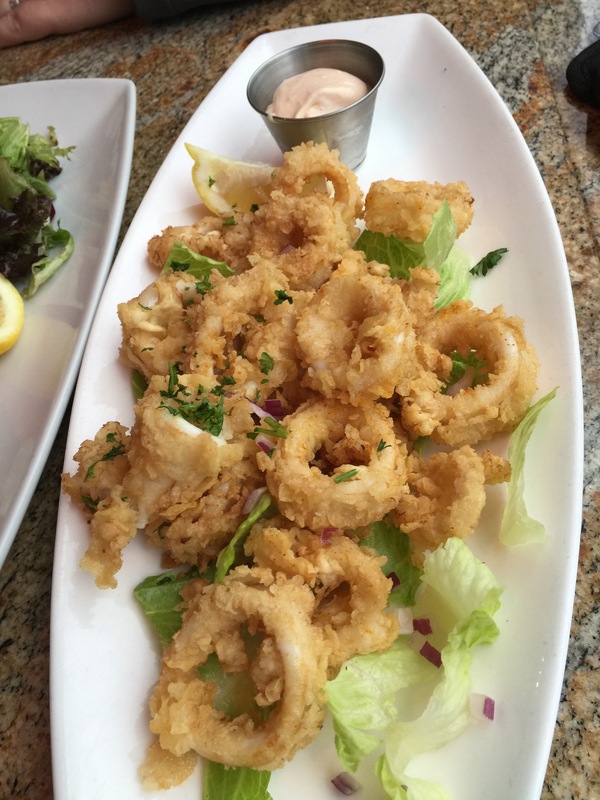 The batter on the calamari was perfect, nice and light and indeed crispy on the outside. The calamari rings were of a good size and the citrus infused chipotle aioli was actually really good with enough flavor but not too much spice and heat. My husband even enjoyed the calamari, which was quite unusual for him. This appetizer was a real winner, delicious and filling and perfectly prepared. 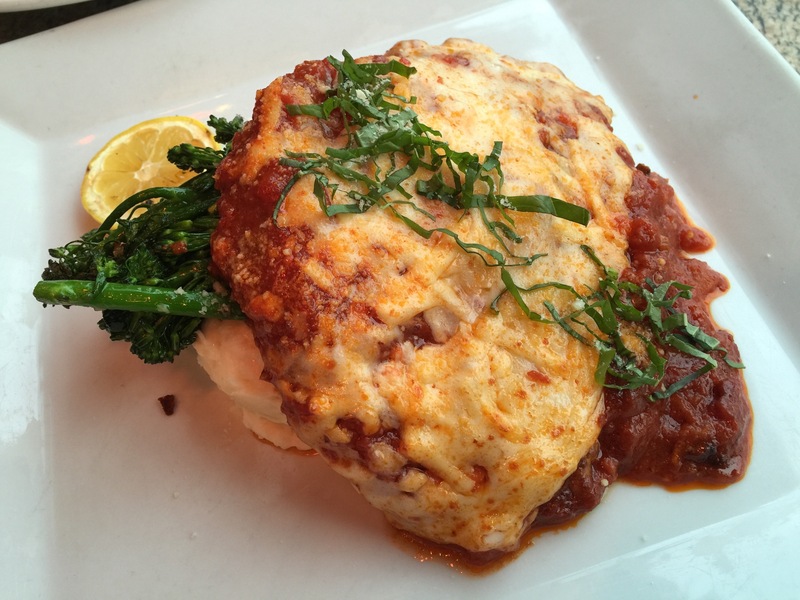 For my dinner, I ordered the chicken parmigiana, which was described as breaded tender “free-run” chicken breast fillet in herbed tomato sauce with garlic mashed potatoes and seasonal vegetables. The dish was huge when it came to the table and I was a little overwhelmed. Unfortunately, I was a bit underwhelmed with the dish itself. The chicken breast fillet was actually cooked well and the chicken was tender and juicy. The breading was decent, but really started to fall off towards the end of my meal as the tomato sauce started to soak into the breading. However, the herbed tomato sauce was quite disappointing, and the mozzarella cheese that topped the chicken breast fillet and melted under the broiler was quite tasteless and stringy in a way that I’m not used to. The tomato sauce tasted quite acidic and really lacked any of the herb flavor it was advertised as having. For some reason, I just felt that the flavor was a little “off” and that was disappointing. In fact, it was the accompaniments on the plate, the garlic mashed potatoes and the roasted broccolini that were the star of the dish. The mashed potatoes were subtly flavored yet nice and creamy and smooth and delicious. The roasted broccolini was fantastic, lots of fresh, bright flavor, and still slightly crunchy. If only a lot more restaurants served broccolini. My husband chose a pasta dish for his meal – aglio e olio e Gamberetti. The name of the dish is a mouthful. 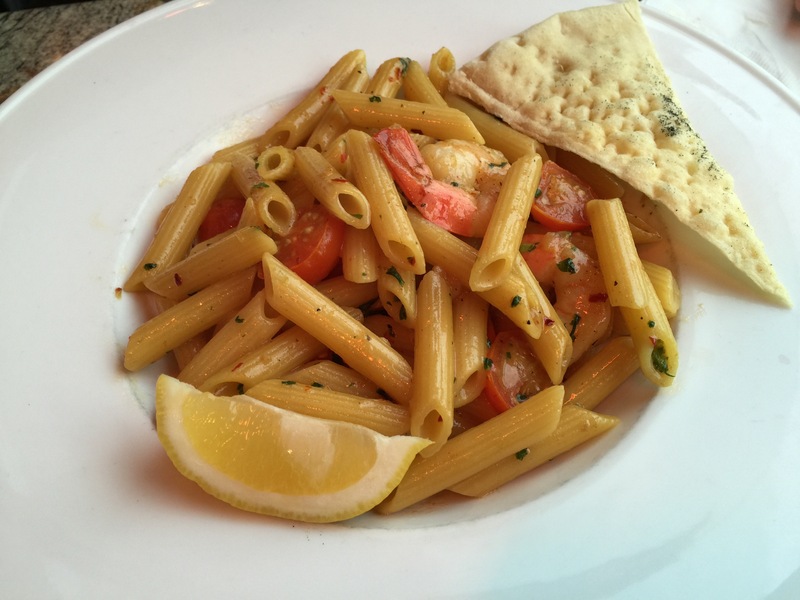 Essentially, the dish is a penne pasta tossed in a garlic olive oil and chili sauce with grilled prawns, fresh grape tomatoes and basil. In contrast to my dish, my husband found his dish to be much tastier and better than he had expected it to be. The garlic olive oil and chili sauce was the star of the dish for my husband. The flavor really permeated throughout the pasta and while it was a little spicy, it wasn’t overpowering. My husband thought that the spice was a nice warm spice that opened up your taste buds. The grilled prawns were good, though not very numerous. However, my husband finished off his entire penne dish and thought that dinner was very filling and quite tasty so he was satisfied. By the end of the night, we were a bit full, but we had spotted a dessert on the dessert menu earlier that we had both wanted to try and it sounded different and unique, so we figured we could find a little bit more room and split a dessert. 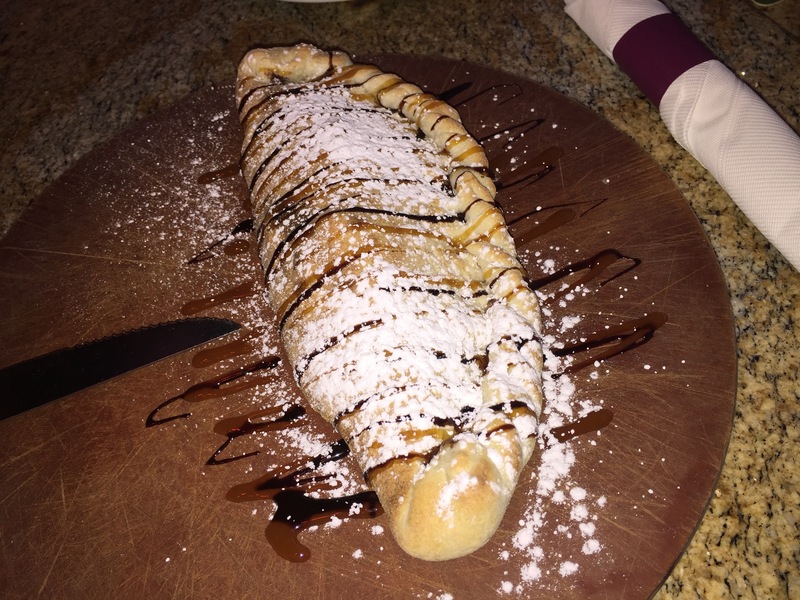 The chocolate calzone was described as mascarpone and chocolate hazelnut in a warm flatbread. The pastry is filled, folded over and baked in the pizza oven. 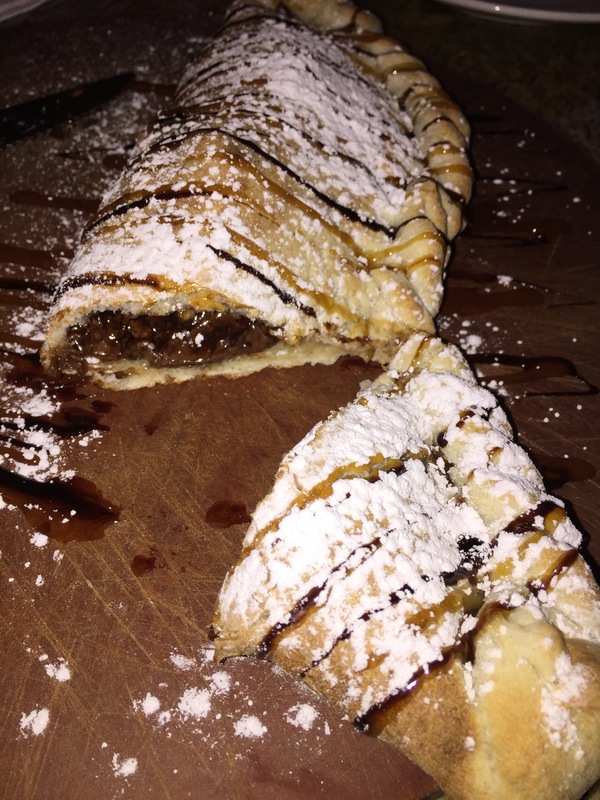 The calzone comes to the table looking exactly like a calzone, but in dessert form topped with a drizzle of chocolate and caramel sauce and topped with a generous helping of powdered sugar. The flavor of the chocolate calzone was fantastic. There was enough filling inside that it didn’t feel like we were just eating pizza dough. The combination mascarpone and chocolate hazelnut was terrific, subtle, but yet still sweet and definitely a dessert. The calzone itself was flaky and crispy and quite filling. I really liked that it was creative and different from what you normally get for dessert at an Italian restaurant. Bellagio Cafe met our needs for what we were looking for for dinner on a Saturday night in downtown Vancouver without any reservations. After having such a long day out in Victoria, we just wanted a nice, relaxing restaurant to sit down and enjoy the evening. 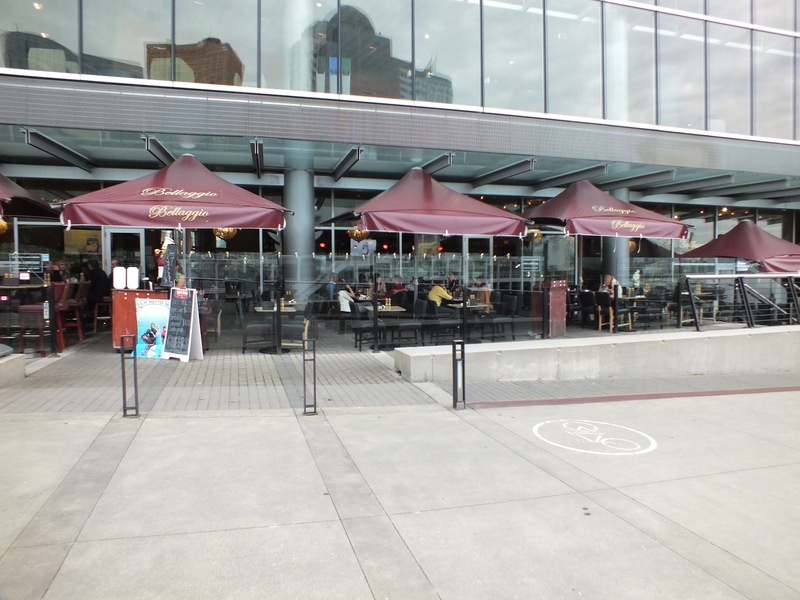 Situated right at Canada Place and with a view of the harbor front, outdoor dining at Bellagio Cafe was nice and relaxing. While the food was hit or miss for me, my husband thoroughly enjoyed his meal. Bellagio Cafe may not be the best Italian restaurant I’ve ever been to before, it worked for what we needed and what we were looking for, and the chocolate calzone was a delicious way to end our meal.